When asked what she wants to be when she grows up, my preschool daughter always replies, "A princess." That's probably not very likely to happen, but maybe someday she'll grow up to write about princesses like Cayla Kluver. At the age of 16, Kluver has already achieved her dream to become a published author. AmazonEncore, a new program developed to bring attention to emerging authors, recently released her debut book called Legacy . Like all exceptional fantasies involving princesses, Kluver's story begins with a tragedy. In this case, the tragedy involves stolen babies and two fictional warring kingdoms, Hytanica and Cokyri. Princess Alera grows up in the kingdom of Hytanica during a time of peace following an awful war. Although she knows of the tragedy, like most in her kingdom, she does not fully understand the whole situation. At the young age of seventeen she also finds herself in a perplexing situation. As heir to the throne, she is expected to marry once she turns eighteen. Her father wishes for her to marry the egotistical Steldor, but Princess Alera is a headstrong and opinionated young women. She struggles with the decision, not knowing whether to fulfill her duty to her kingdom or to follow her heart. She becomes even more confused when a young, handsome and mysterious stranger from Cokyri named Narian enters her kingdom and disrupts their peaceful existence. 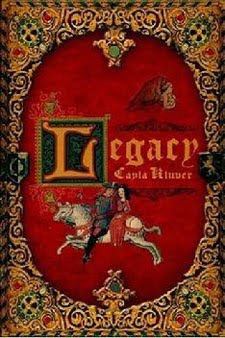 Legacy is the first book in a trilogy. How truly refreshing to discover a book with well-written teen characters depicted through the eyes of a teen author! Through the use of appropriate mannerisms and expressions, Kluver created endearing characters with just the right sense of naïveté. Although the descriptive passages sometimes seem overdone and forced, the interesting, flowery dialogue between the characters drives the romantic and suspenseful story and leaves readers wanting to know exactly how the fairy tale ends. I can hardly wait to read the next book in the series; the cliffhanger ending is brutal. I love that while this book is classified as fantasy, it is not of the high fantasy genre containing mythological creatures, but borders more on the historical romance genre. During my teen years I tended to gravitate toward romantic suspense novelists like Eleanor Hibbert (a.k.a. Victoria Holt/Jean Plaidy). I know for a fact I would have enjoyed escaping in the story of Legacy then, just as much as I enjoyed reading it now, as an adult. In case you were wondering, Kluver innocently portrays romantic scenes with pure passion (no x-rated material). There's also a notable twist in this princess story--in the progressive kingdom of Cokyri, women rule and are highly regarded and treated with respect. In an interview with The Blogger Girlz, Kayla remarks, "the realization that young people can accomplish things kind of pushed me to a place where I had the motivation to finish a novel." Amazingly, Kluver wrote Legacy when she was only 14 years old. I'm intrigued by this young Wisconsin author, look forward to her next novels and hope that her success encourages other youth to pursue writing careers. I read this review in my reader and did not comment. I will say, the inspiring thing about this book is that is written by a teenage girl. I have a 14 year old daughter who writes well...she tinkers around with her own stories. This story sounds wonderful. I also really do like the cover. I am going to head over to the giveaway and enter. If I do not win, I will purchase this book as I like the idea to help a young author besides, I think it will be cool for my girls to read a book written by someone close to their ages. This looks like a good book to read or at least have for my children as they grow up. I like that women are placed in high regard in the book. Wow, I am completely and totally impressed that she wrote the book when she was 14. I'll be curious to see what she writes in the future. I love princess stories, and I prefer fantasy that doesn't get too heavily into mythological creatures, so this sounds right up my alley. I have heard lots of good things about this book so I am glad you liked it. It is also really exciting that she wrote it when she was 14. Wow! This story does sound interesting and exciting. Thanks for the great review and giveaway. I am guilty as well, there are so many blogs and I would love to visit more of them actually reading all the posts but most often I just skim through and then move on. Did you see the Times article 6/22/09 about Amazon and what they did for Carla? I even photocopied it - interesting stuff. Hard to believe that this book was written by a girl so young. This book shows just how much potential she has and I for one cant wait to read it. I will enter your giveaway in hopes of winning. Thanks for your insightful review. National Family Game Night and Pictureka! Wordless Wednesday - Do Princesses Kiss Toads? Where I reveal my TBR and the latest winners!